Ultrasonic Bolt Tension Monitors (Extensometers) measure the elongation produced by tightening a threaded fastener. Our line of monitors can measure the elongation very accurately in fasteners of virtually any material from 1/2 inch to 100 feet in length. The operator uses the to instrument measure the length of a bolt or fastener before it is tightened and again after it is tightened to calculate the delta or change in length. The on-board microcomputer automatically interprets this measurement to display the time (nanoseconds), elongation, load, stress, or %strain from stretching a fastener. The MAX II Ultrasonic Bolt Tension Monitor is designed for precision measurement of fasteners up to 100 ft / 30 m in length. It incorporates all of the great features of the original MiniMax unit, with improved features, hardware, speed, and range. 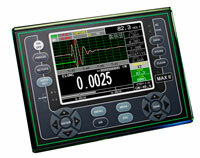 The MAX II is designed for use in a wide range of industrial and lab applications.